Chana masala, chole masala, channay, cholay is a very popular north Indian dish. Each city has it’s own version and there are many interpretations of this dish. Some soak chickpeas in tea,others used tinned, some use a pressure cooker. My recipe is rather quick, easy and full of flavour. Punjabi’s love chickpea curry with roti, puri, naan, bhatura, aloo tikki and most popularly on samosa’s. I add paneer to mine as it gives an extra element of opulence and it really works well with the chickpeas. Full of protein and fibre chickpeas are great for vegetarians and perfect for carnivores who love good food. 1Heat the oil in a large heavy bottomed pan. Add the cumin seeds, and once they start changing colour add the onion puree and salt. 2Cook the onions for 12-15 minutes on a medium/high heat or until they're golden brown. 3Add the ginger and garlic puree and stir for 2 minutes. 5Stir in the tomato puree, mixing everything well and let it cook for 2 minutes. Ensure you stir all the time. 6Rinse the chickpeas and add them to the masala followed by the paneer. 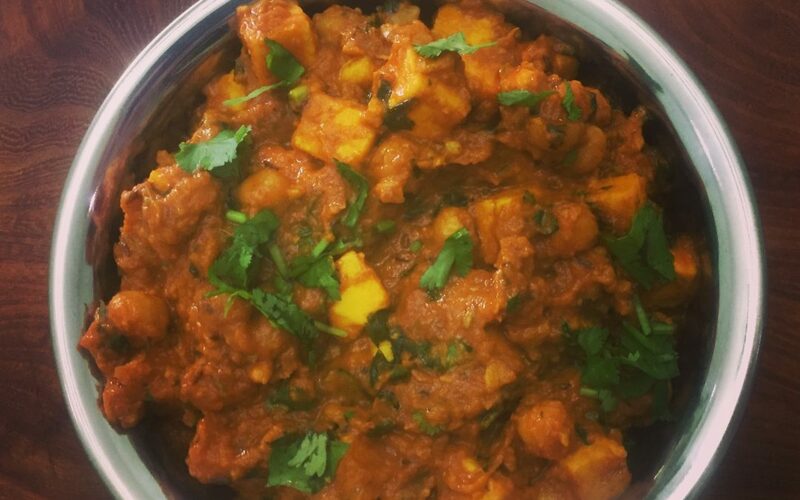 Coat both the chickpeas and the paneer with the thick masala. 7Pour in the water and mix well. bring the mixture to a simmer. Put a lid on the pan and let it cook for 5 minutes on a medium heat. Stir occasionally. 8Stir in the chopped coriander. Serve with hot chapatti's, naan, or bhatura's. I tried this recipe today and I can’t tell you how good this was, simple easy with great ingredients my husband literally licked his plate. Thank you for your recipes everyone that I have tried has been just absolutely delicious.